How to stabilize scales, the easy way. View larger or ask the author a question. Come Join the Discussion Today! To survive, you need water and food. You must also have and apply high personal hygiene standards. Your body loses water through normal body processes (sweating, urinating, and defecating). During average daily exertion when the atmospheric temperature is 20 degrees Celsius (C) (68 degrees Fahrenheit), the average adult loses and therefore requires 2 to 3 liters of water daily. Other factors, such as heat exposure, cold exposure, intense activity, high altitude, burns, or illness, can cause your body to lose more water. You must replace this water. A 5 percent loss of body fluids results in thirst, irritability, nausea, and weakness. A 10 percent loss results in dizziness, headache, inability to walk, and a tingling sensation in the limbs. A 15 percent loss results in dim vision, painful urination, swollen tongue, deafness, and a numb feeling in the skin. A loss greater than 15 percent of body fluids may result in death. Dark urine with a very strong odor. Delayed capillary refill in fingernail beds. Trench line down center of tongue. Thirst. Last on the list because you are already 2 percent dehydrated by the time you crave fluids. You replace the water as you lose it. Trying to make up a deficit is difficult in a survival situation, and thirst is not a sign of how much water you need. Most people cannot comfortably drink more than 1 liter of water at a time. So, even when not thirsty, drink small amounts of water at regular intervals each hour to prevent dehydration. If you are under physical and mental stress or subject to severe conditions, increase your water intake. Drink enough liquids to maintain a urine output of at least 0.5 liter every 24 hours. In any situation where food intake is low, drink 6 to 8 liters of water per day. In an extreme climate, especially an arid one, the average person can lose 2.5 to 3.5 liters of water per hour. In this type of climate, you should drink 14 to 30 liters of water per day. With the loss of water there is also a loss of electrolytes (body salts). The average diet can usually keep up with these losses but in an extreme situation or illness, additional sources need to be provided. A mixture of 0.25 teaspoon of salt to 1 liter of water will provide a concentration that the body tissues can readily absorb. Always drink water when eating. Water is used and consumed as a part of the digestion process and can lead to dehydration. Acclimatize. The body performs more efficiently in extreme conditions when acclimatized. Conserve sweat not water. Limit sweat-producing activities but drink water. Ration water. Until you find a suitable source, ration your water sensibly. A daily intake of 500 cubic centimeter (0.5 liter) of a sugar-water mixture (2 teaspoons per liter) will suffice to prevent severe dehydration for at least a week, provided you keep water losses to a minimum by limiting activity and heat gain or loss. You can estimate fluid loss by several means. A standard field dressing holds about 0.25 liter (one-fourth canteen) of blood. A soaked T-shirt holds 0.5 to 0.75 liter. With a 0.75 liter loss the wrist pulse rate will be under 100 beats per minute and the breathing rate 12 to 20 breaths per minute. With a 0.75 to 1.5 liter loss the pulse rate will be 100 to 120 beats per minute and 20 to 30 breaths per minute. With a 1.5 to 2 liter loss the pulse rate will be 120 to 140 beats per minute and 30 to 40 breaths per minute. Vital signs above these rates require more advanced care. Although you can live several weeks without food, you need an adequate amount to stay healthy. Without food your mental and physical capabilities will deteriorate rapidly, and you will become weak. Food replenishes the substances that your body burns and provides energy. It provides vitamins, minerals, salts, and other elements essential to good health. Possibly more important, it helps morale. The two basic sources of food are plants and animals (including fish). In varying degrees both provide the calories, carbohydrates, fats, and proteins needed for normal daily body functions. Calories are a measure of heat and potential energy. The average person needs 2,000 calories per day to function at a minimum level. An adequate amount of carbohydrates, fats, and proteins without an adequate caloric intake will lead to starvation and cannibalism of the body's own tissue for energy. These foods provide carbohydrates--the main source of energy. Many plants provide enough protein to keep the body at normal efficiency. Although plants may not provide a balanced diet, they will sustain you even in the arctic, where meat's heat-producing qualities are normally essential. Many plant foods such as nuts and seeds will give you enough protein and oils for normal efficiency. Roots, green vegetables, and plant food containing natural sugar will provide calories and carbohydrates that give the body natural energy. You can dry plants by wind, air, sun, or fire. This retards spoilage so that you can store or carry the plant food with you to use when needed. You can obtain plants more easily and more quietly than meat. This is extremely important when the enemy is near. Meat is more nourishing than plant food. In fact, it may even be more readily available in some places. However, to get meat, you need to know the habits of, and how to capture, the various wildlife. To satisfy your immediate food needs, first seek the more abundant and more easily obtained wildlife, such as insects, crustaceans, mollusks, fish, and reptiles. These can satisfy your immediate hunger while you are preparing traps and snares for larger game. In any situation, cleanliness is an important factor in preventing infection and disease. It becomes even more important in a survival situation. Poor hygiene can reduce your chances of survival. A daily shower with hot water and soap is ideal, but you can stay clean without this luxury. Use a cloth and soapy water to wash yourself. Pay special attention to the feet, armpits, crotch, hands, and hair as these are prime areas for infestation and infection. If water is scarce, take an "air" bath. Remove as much of your clothing as practical and expose your body to the sun and air for at least 1 hour. Be careful not to sunburn. Extract grease from animal fat by cutting the fat into small pieces and cooking them in a pot. Add enough water to the pot to keep the fat from sticking as it cooks. Cook the fat slowly, stirring frequently. After the fat is rendered, pour the grease into a container to harden. Place ashes in a container with a spout near the bottom. Pour water over the ashes and collect the liquid that drips out of the spout in a separate container. This liquid is the potash or lye. Another way to get the lye is to pour the slurry (the mixture of ashes and water) through a straining cloth. In a cooking pot, mix two parts grease to one part potash. Place this mixture over a fire and boil it until it thickens. After the mixture--the soap--cools, you can use it in the semiliquid state directly from the pot. You can also pour it into a pan, allow it to harden, and cut it into bars for later use. Germs on your hands can infect food and wounds. Wash your hands after handling any material that is likely to carry germs, after visiting the latrine, after caring for the sick, and before handling any food, food utensils, or drinking water. Keep your fingernails closely trimmed and clean, and keep your fingers out of your mouth. Your hair can become a haven for bacteria or fleas, lice, and other parasites. Keeping your hair clean, combed, and trimmed helps you avoid this danger. Keep your clothing and bedding as clean as possible to reduce the chance of skin infection as well as to decrease the danger of parasitic infestation. Clean your outer clothing whenever it becomes soiled. Wear clean underclothing and socks each day. If water is scarce, "air" clean your clothing by shaking, airing, and sunning it for 2 hours. If you are using a sleeping bag, turn it inside out after each use, fluff it, and air it. Thoroughly clean your mouth and teeth with a toothbrush at least once each day. If you don't have a toothbrush, make a chewing stick. Find a twig about 20 centimeters long and 1 centimeter wide. Chew one end of the stick to separate the fibers. Now brush your teeth thoroughly. Another way is to wrap a clean strip of cloth around your fingers and rub your teeth with it to wipe away food particles. You can also brush your teeth with small amounts of sand, baking soda, salt, or soap. Then rinse your mouth with water, salt water, or willow bark tea. Also, flossing your teeth with string or fiber helps oral hygiene. If you have cavities, you can make temporary fillings by placing candle wax, tobacco, aspirin, hot pepper, tooth paste or powder, or portions of a ginger root into the cavity. Make sure you clean the cavity by rinsing or picking the particles out of the cavity before placing a filling in the cavity. To prevent serious foot problems, break in your shoes before wearing them on any mission. Wash and massage your feet daily. Trim your toenails straight across. Wear an insole and the proper size of dry socks. Powder and check your feet daily for blisters. Obtain a sewing-type needle and a clean or sterilized thread. Run the needle and thread through the blister after cleaning the blister. Detach the needle and leave both ends of the thread hanging out of the blister. The thread will absorb the liquid inside. This reduces the size of the hole and ensures that the hole does not close up. You need a certain amount of rest to keep going. Plan for regular rest periods of at least 10 minutes per hour during your daily activities. Learn to make yourself comfortable under less than ideal conditions. A change from mental to physical activity or vice versa can be refreshing when time or situation does not permit total relaxation. Do not soil the ground in the camp site area with urine or feces. Use latrines, if available. When latrines are not available, dig "cat holes" and cover the waste. Collect drinking water upstream from the camp site. Purify all water. 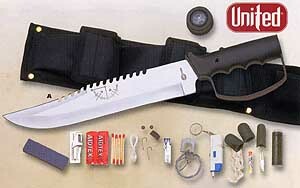 This 15 inch survival knife with drop point blade features a thick quality stainless steel blade with serrated top edge. Textured and ribbed solid metal handle and guard. Nylon sheath. Survival kit includes a hollow grip with a compass top to store items within the knife itself, as well as additional pouches on the sheath to hold the rest. Complete survival kit. Click Here to Buy the Survival Knife Now. Copyright © 2001 - 2019 Jalic Inc. All Rights Reserved.